Star Wars: Knights of the Old Republic: The Sith Lords (KotOR II), outside being the game with most colons in its title, is one of the best games I’ve ever played. Were there multiple issues, like bugs upon bugs and so much cut content that you could’ve made a separate game from it? Yep, but at its heart was an amazing story that could go down several diverging paths and complex characters who beckoned you to dig deeper into the game. Honestly, KotOR II utterly outshines KotOR, even though it was a masterpiece in its own right. In KotOR, the story, while well-crafted, is pretty straightforward and tells a tale that is familiar to most audiences. A protagonist goes out into the world, gains power, and ultimately decides the fate of a massive conflict. There are twists to be sure, as well as exquisite voice acting to bolster the story, but in the end, it doesn’t necessarily shed new light in the world of Star Wars. You’re just a Jedi (or Sith) who is just really, really powerful. KotOR II, on the other hand, actively seeks out the deeper mysteries of the Force as it tells a story through the player’s interaction with their crew. 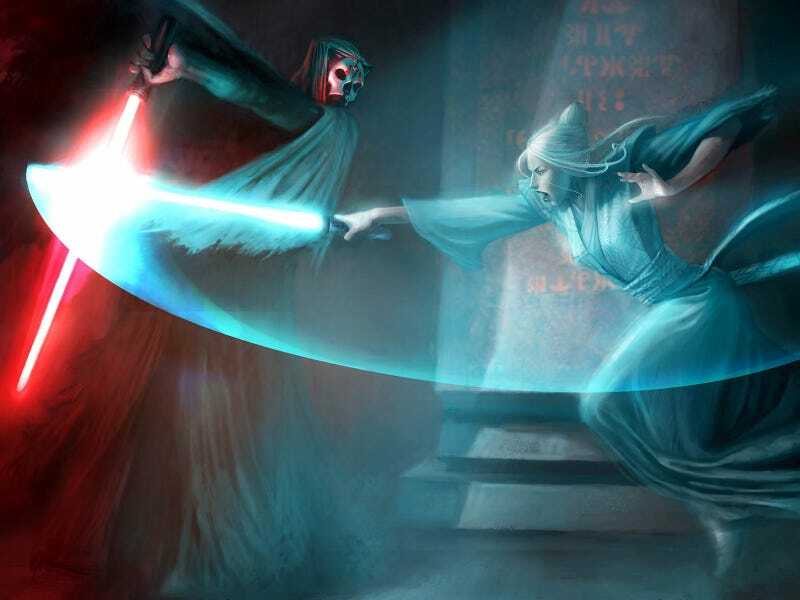 While KotOR focused on you becoming more attuned with the force, KotOR II wanted to explore what would happen if a Jedi was cut off from it. The Force is a power that connects every living thing in the universe together; it is essentially the heartbeat of all life. To be cut off from the very thing that not only grated you immense power, but tied you to every creature in existence is a violent and traumatic event. You don’t live the same way you used to, and when you start reconnecting to the Force, it doesn’t flow through you anymore; it echoes within you. This concept of seeing this all-encompassing power being A.) damaged to such an extent that people and planets can become wounds within it, and B.) still be utilized in terrifying ways was fascinating to behold, and it provided a new perspective to a core aspect of a beloved series. It wasn’t just your connection to the Force that kept players coming back to the game; it also your connections to your comrades. These individuals had rich backgrounds that could be fully fleshed out during a playthrough, which could unlock certain ability upgrades. Some could even become Jedi/Sith under your tutelage. In the original, you could pry a NPC’s backstory out of them, but it didn’t really affect gameplay. With KotOR II, by talking with your fellows, some of them could eventually wield lightsabers and force push the heck out of enemies, which is categorically awesome. Obsidian, the game’s developer, took a basic mechanic and built an intricate system that makes the Star Wars universe much more three dimensional. It gives you reasons to care, either to know more about the NPCs’ motivations and understand their personal experiences, or to have a force-wielding murder squad that can tear any opposition to shreds. Having this level of influence over another character is intoxicating and a wise design choice on Obsidian’s part. The sorrowful horns signal a weariness to the player. They almost have a creaking quality to them, signifying the strain the Republic in under. It’s an old government being brought down by not only its own weight, but the exorbitant cost of fighting two galactic-spanning wars in less than ten years. It’s at the brink of collapse, and through your actions, you can quietly patch it up so that it can eventually run on its own again, or give it the gentle push to fall to pieces. The foes who are conspiring to topple the Republic are shadowy figures, and the song highlights this mysterious element of the story. It is up to you, The Exile, to solve it and to determine what will happen to galaxy. The subtlety of the story adds a level of intrigue that KotOR simply did not have, and it makes for a richer experience. Obsidian answered the question of how to improve a beloved and respected game by crafting its sequel. KotOR II may be rough around the edges, but the story it tells is a godsend, and it is easily the best entry into the series. It is the Empire Strikes Back to KotOR’s A New Hope, and not just chronologically, but quality as well.